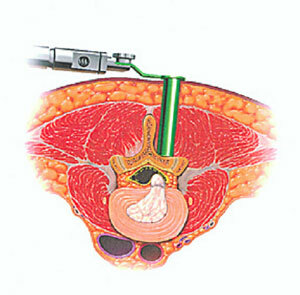 Minimally Invasive Surgery for herniated discs utilizes dilator tubes and muscle spreading/splitting moves to access critical areas for treatment of herniated discs. I typically perform up to two discectomies on the same level at different time periods before recommending the need for instrumentation. Patient’s presenting with a chief complaint of leg pain benefit most from this procedure. The microscope is brought in with its illumination and magnification and a power precision drill is utilized to remove a small portion of bone exposing ligament covering the nerve endings in question. The ligament is then removed with different micro-instruments exposing the disc that is compressing the nerve endings. A small incision is then placed over the disc and only the portion of the disc compressing the nerve endings is removed. The small 18-22mm incision is closed with absorbable sutures and “glue”. Patients typically go home the same day of surgery.